I cooked this recipe for the first time a few weeks ago whilst staying on the Isle of Wight (I’m often over on the Island as I love it so much). The recipe is from The Medicinal Chef cookbook by Dale Pinnock and is absolutely delicious and simple to make. Preheat the oven to 180°. Put the peppers and courgettes into a roasting tin and drizzle with a little olive oil and season with salt and pepper. Add half of the crushed garlic. Roast in the oven for about 15-20 minutes or until soft (I like them just with a little colour to the edges). Meanwhile, heat a little olive oil in a pan; add the remaining garlic and cook gently for 1-2 minutes until it begins to turn fragrant. Add the drained beans and stir well until heated through. Mash the beans in the same way as you would mash potato. Instead of adding milk and butter, add a little extra-virgin olive oil to give it a creamy texture. Stir in the chopped coriander, the lemon juice and season with salt and pepper. I coated my butterflied chicken fillets with a lemon zest/pepper mix and then cooked them in a George Foreman grill for just four minutes so they were really succulent. This was a definite hit with my husband and the peppers/mash could be served on their own or with a variety of salads or meat. A very versatile, tasty dish. 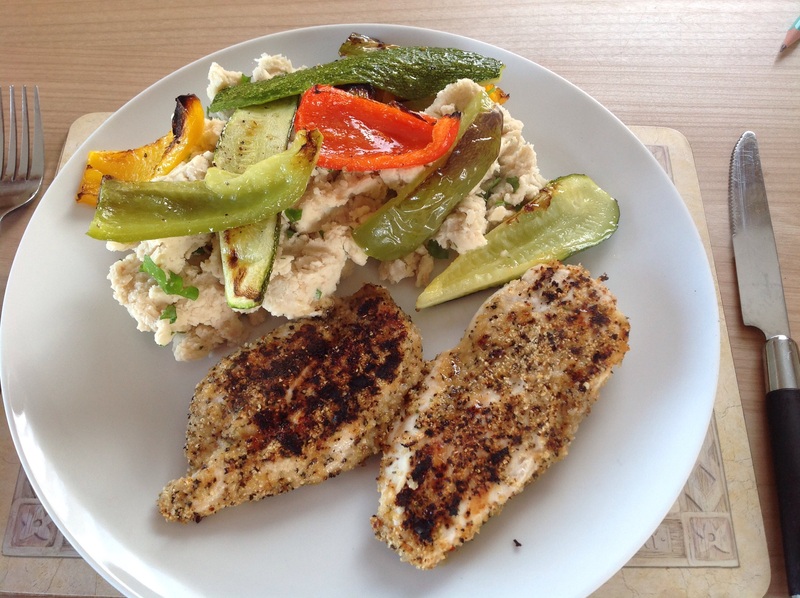 This entry was posted in Dinner, Lunch and tagged Cooking, Courgettes, Healthy Eating, Recipes, Roasted Peppers, White Beans. Bookmark the permalink.